How Did The Pickup Truck Evolve? Pickup trucks are standard equipment for most hardworking people around the world. Trucks have come a long way since the early days of horse-drawn wagons. Today, new and used trucks are status symbols as well as working tools. Truck options range from being compact with two seats, to oversized models with king cabs. Just like the automobile, the pickup truck was first developed in the United States. Chevrolet was the innovative company that first mass produced pickup trucks, and their Chevy and GMC truck lines are still thriving today. In the early 1900s the automobile was still a novelty. People still relied on horse-drawn open wagons and carts to carry around their heavy cargo. The automobile engines and designs didn’t readily lend themselves to carrying around large loads. They were relegated mostly to the role of large toys for the wealthy. A farmer or construction worker could hitch up as many horses as necessary to handle the biggest loads, and he could drive his horse-truck over almost any terrain necessary. It took several years before passenger car manufacturers began to think of an alternative to these. In 1918, Chevrolet produced the first assembly line pickup truck. The Chevrolet Model 490 Light Delivery truck sported a tall, narrow cab in front of a low, flat truck bed, and carried 1/2 ton payloads. The instrument panel, seats, and steering wheel were exactly the same as those in the passenger cars Chevy released that year. 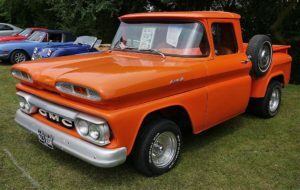 Customers were expected to buy or build the cab and body of the truck separately for the first pickup models. Chevrolet also produced a one-ton truck in 1918, called the Model T, which was a burlier version of their passenger car chassis and frame. For many years, pickup trucks remained hybrid versions of the passenger cars that Chevrolet sold. Eventually, though, the need for stronger trucks made it necessary to create the pickups from scratch. Chevrolet and GMC began to produce trucks separately from passenger cars so that they could focus on exactly what their customers needed. Many different types of trucks were created to meet the different needs of customers. Small, light trucks were developed for people who didn’t need to carry heavy loads. Larger trucks with more horsepower were put to work by companies that carried larger loads. The pickup trucks of today range from sporty and fun to heavy duty workhorses. The useful nature of an open pickup truck bed has caused many consumers to trade in their used cars for used trucks. Chevrolet and GMC have extensive lines of trucks with a variety of features. Most of the truck models today come with all of the comforts of luxury cars. Leather seats, high-tech instruments, and climate controls are an extra bonus in these modern work vehicles.